This single storey cottage near Okeford Fiztpaine sleeps two people in one bedroom. 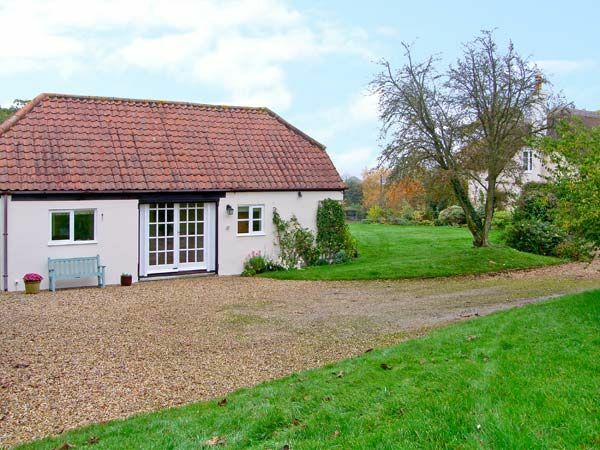 Oke Apple Cottage is a single storey cottage in an Area of Outstanding Natural Beauty half a mile from Okeford Fitzpaine. The cottage has an open plan living area, a shower room and a bedroom which can be offered as a super king-size double or a twin. Outside is off road parking for one car and shared use of the lawned garden and swimming pond, along with a private patio with furniture. Oke Apple Cottage is an ideal retreat for a couple or pair of friends to enjoy the peace of this countryside location and the touring opportunities it affords. Amenities: Storage radiators with electric fire in sitting area. Electric oven and hob, microwave, fridge, small freezer, TV with Freeview, WiFi, selection of books and games. Fuel and power inc. in rent. Bed linen and towels inc. in rent. Off road parking for 1 car. Shared rear lawned garden with private patio and furniture. Shared use of swimming pond. One well-behaved dog welcome (to be kept on a lead at all times due to livestock). Sorry, no smoking. Shop and pub 10 mins walk. Note: The owner has 3 dogs and there are donkeys and chickens on site. This property does not accept children under the age of 8. Town: Okeford Fitzpaine is a small village in an Area of Outstanding Natural Beauty, a few miles from the market town of Dorset. This area is ideal for walking, the coastline, Thomas Hardy country and towns such as Sherborne and Shaftesbury. All ground floor. One super king-size double bedroom (zip/link, can be twin on request). Shower room with shower, basin and WC. Open plan living area with fitted kitchen, dining area and sitting area with electric flame-effect fire. Storage radiators with electric fire in sitting area. Electric oven and hob, microwave, fridge, small freezer, TV with Freeview, WiFi, selection of books and games. Fuel and power inc. in rent. Bed linen and towels inc. in rent. Off road parking for 1 car. Shared rear lawned garden with private patio and furniture. Shared use of swimming pond. One well-behaved dog welcome (to be kept on a lead at all times due to livestock). Sorry, no smoking. Shop and pub 10 mins walk. Note: The owner has 3 dogs and there are donkeys and chickens on site. This property does not accept children under the age of 8.